Your monthly online resource for better boards and better directors. Economic turmoil… tough new reform laws… huge board workloads and liability dangers… today’s top achievers know just how urgent boardroom savvy has become. My name is Ralph Ward, and I’d like to give you the inside track on shaping a safe, smart board of directors. Since 1997, my online newsletter, Boardroom INSIDER has tapped the world’s most seasoned directors and governance pros to give you a powerful boardroom mentor. The secrets of effective boardroom leadership. How governance reforms are shaking up your board membership, liabilities, skills and structure… and how you can cope. Shaping your personal boardroom career. Navigating tricky personal/political battles among directors, CEOs, founders, etc. Board Q&A: When you’re the “lone voice” on the board… healing boardroom factions… is our board missing danger signs? Best practice tips for excellent audit committees, director ethics, paysetting, M&A, board meetings & agendas. 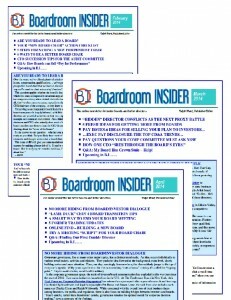 Subscribe to Boardroom INSIDER Now! Every month, you’ll get tip after tip, insight after insight for smarter, more valuable more effective directors and boards — in a .PDF document delivered directly to you via e-mail. Your individual subscription price — only $249 per year. Plus, as a subscriber, you get free reprints of back articles (see ) — instantly build your own customized boardroom library! And you must be satisfied with your subscription — if not, contact me for a full refund of your subscription price — 100% guaranteed! Don’t miss another issue! 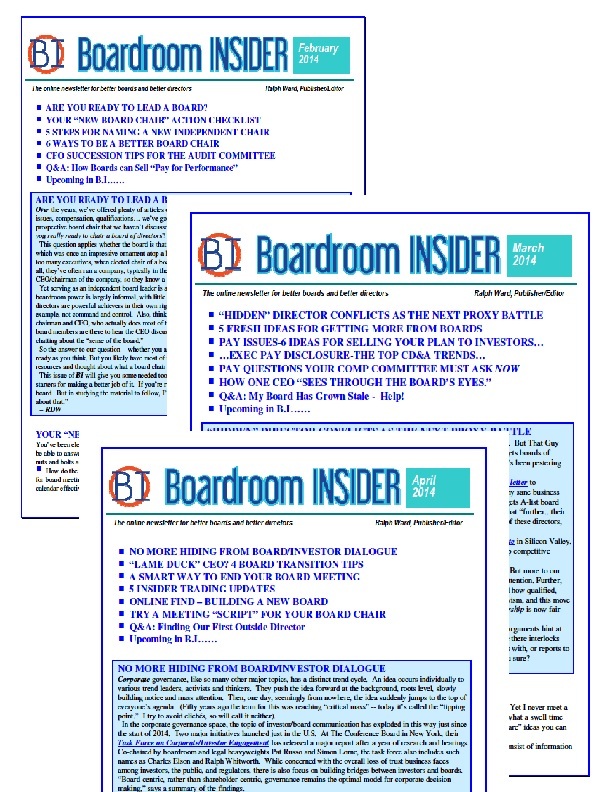 Start your subscription to Boardroom INSIDER today!